Use a unique non-floral element in your hanging installation to draw attention and intrigue guests. At The Bait Shoppe’s First Aid Beauty Event, their install served as a backdrop for their photo moment centered around a bench. 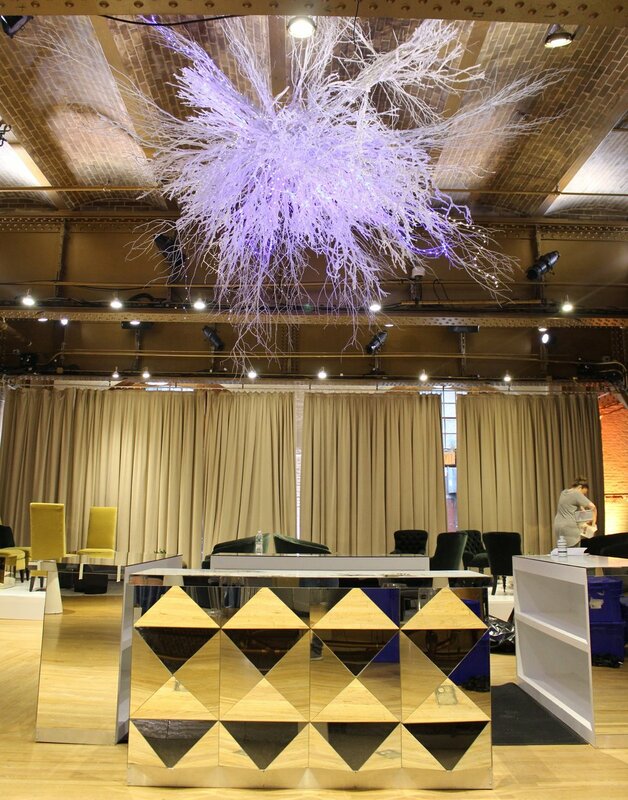 For this piece, we used clear monofilament wire to hang numerous fluffy all-white feathers. We had to use our own discretion on how to disguise the hanging structure, but it came together beautifully! Create an otherworldly feeling through the use of dramatic draped greenery in your installation. 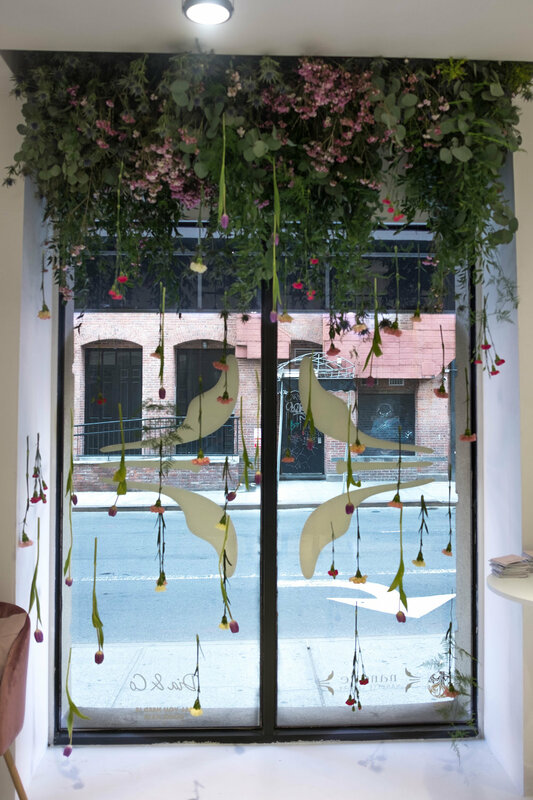 We created this hanging garden for Intermix last year at their Best Dressed Guest Event! In addition to the hanging floral install, they also featured a bouquet station. We used lush greenery and florals in each bouquet to give off springtime vibes. Embrace the use of negative space to catch the eyes of all of your guests with more simplistic hanging installations. 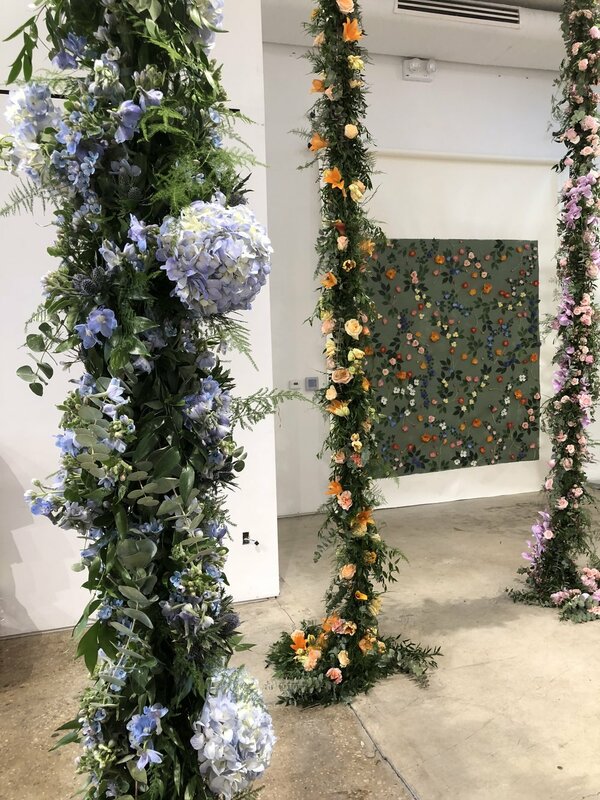 At our very own B Floral Spring Media Event, we knew we wanted to showcase some type of hanging installation that would take our event to the next level. We decided on hanging floral garland for the entranceway of our venue. It would be the first thing that our attendees saw, and it would illicit the magical springtime ambience we were hoping for. Complement the rest of your event décor by using similar design elements throughout all pieces. 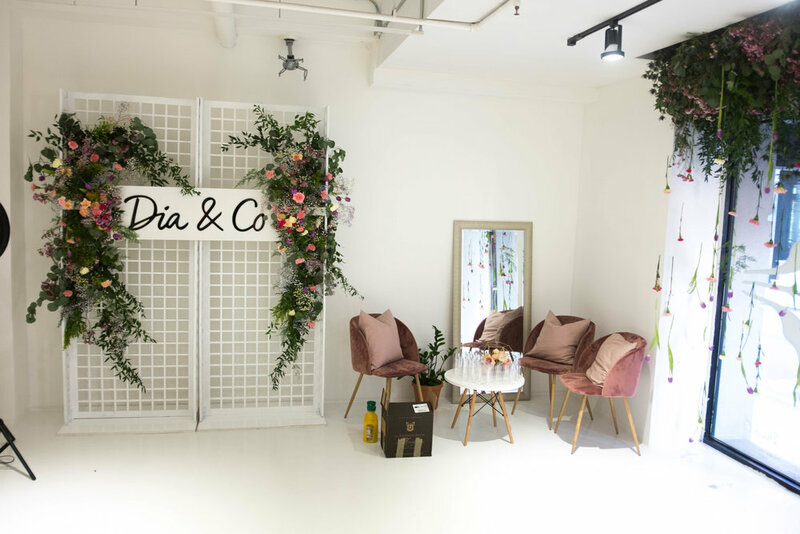 Dia & Co wanted a floral curtain effect in their front window for their pop-up shop. We created a hanging window display that featured heavier textured greenery towards the top and hanging floral accents throughout the length of the window with enough negative space to see through to the actual pop-up. The florals were mainly an assortment of pastel blooms with a mix of baby’s breath to evoke a dainty ‘wildflower’ feel. Break up a static room by hanging full garlands from the ceiling — it will make your event feel even more immersive! MKG’s Old Navy Spring Dress Preview utilized five ceiling to floor floral garlands with full bases. The lush garlands were created using monochromatic florals which pooled on the ground in a swirl to create a stunning moment at the bottom of each piece. We used the event’s overall color palette for the spring florals on each of the garlands! Make your hanging installation your statement piece. At the Paypal and Venmo 2018 holiday party, hosted at The Altman Building, we used non-floral materials for their hanging installation. The piece was comprised of multiple intertwined birch branches. Mixed in with the branches were white and blue lights to illuminate the center of the space. It was placed directly above their bar, and acted as a grand statement piece due to its size. Use your install to create an entrance to an event that sets the mood. 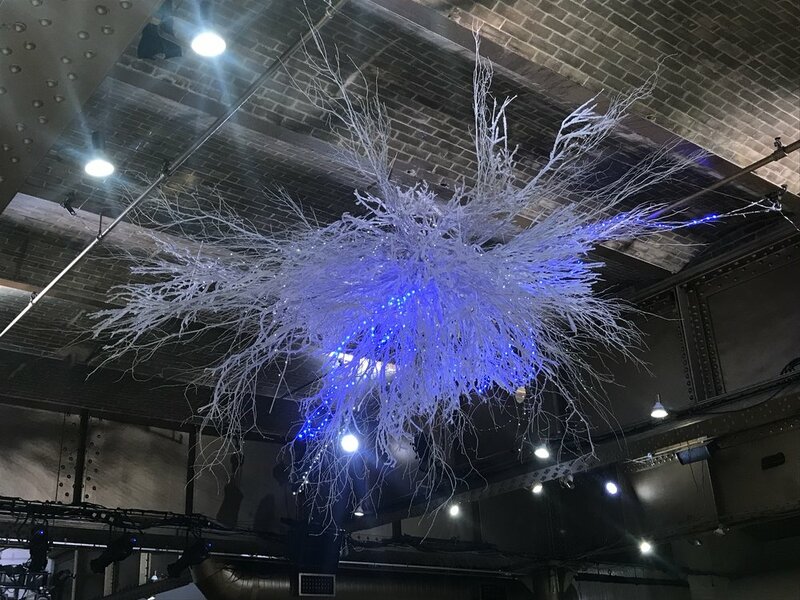 At Satis&fy’s Ketel One Botanicals Event, a hanging flower installation was used to feature the real elements found in the product being celebrated. We used floral elements such as mint green organza Boston fern, Italian ruscus, pothos, gardenia leaf, moss, English ivy, mokara orchids, stephanotis, and many varieties of roses. On top of all of these amazing florals, we incorporated the fruits which are infused into the vodka: Oranges, grapefruits, and peaches. Keep things simple and elegant with thin garlands repeating above a product display. The hanging installation at the Small Girls PR’s Betsey Johnson Press Preview was one of our favorites! For this project, we used hanging garlands composed of light greenery such as ivy, ruscus, and plumosa with evenly distributed small clusters of white roses evenly spread throughout. The garlands were staggered above the shelving displays and tapered towards the ground on either side against the wall. A hanging installation is just one way to make an event even more immersive. Combined with other elements, such as branded carts, an elaborate logo wall, a non-floral photo moment, and many others, a hanging installation can act as a way to tie all decor together. It can be a statement piece that will WOW guests and be a photo moment that all will be trying to capture for the ‘gram. Give your guests something to talk about at your next event with your own hanging installation, where the elements used have no limit!